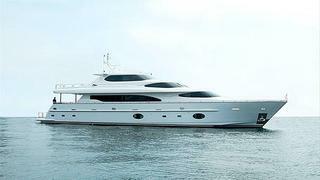 Ordered in June 2012 by a repeat client, the 32m motor yacht Agora was recently launched by Horizon. Now the Taiwanese yard has reported successful sea trials. Powered by twin 1,417kW Caterpillar C-32 engines, Agora reached a top speed of 22.5 knots and a cruising speed of 17 knots during the sea trials. Agora comes from the RP105 series, which is based on the successful RP97 series. Designed by the yard’s in-house team and built to RINA classification, she has a an enclosed flybridge with a large skylounge. The interior, designed by Luca Dini, accommodates 10 guests in a main-deck master suite and four double cabins on the lower deck. Agora will be delivered this summer to her Japanese owners.